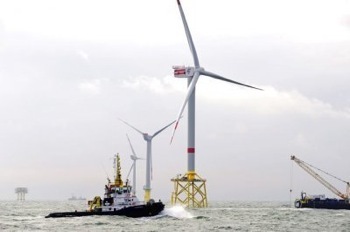 Apparently this proposal has little chance of proceeding, but in June the British House of Lords spent two hours discussing a bill that would establish a 2km setback provision for new wind farms. Such a setback would leave little room for new wind farms in England, but many suitable sites would remain in Scotland. The Parliament website has the full text of the debate, replete with the always-entertaining combination of formality and shouted “interventions” from dissenting members. Go to this page and scroll down just a bit, past the prayer and a quick “dog control notice”; the first major topic is the wind farm bill, and discussion lasts from 10:17 until shortly after noon. 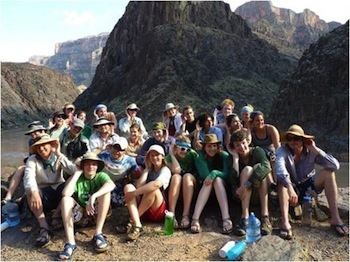 A group of 17 teens with mixed hearing ability (most with significant hearing loss) recently took a five-day river trip down the Grand Canyon as part of a program entitled Hear the World Sound Academy: Amplifying the Grand Canyon. The Sound Academy students traveled with Bill Barkeley, a world-class mountain climber and one of the 15,000 people in the United States with Type 2 Usher’s Syndrome – the leading cause of deaf-blindness in the world. Bill’s 2007 summit of Mount Kilimanjaro shattered expectations and confirmed his role as an advocate and inspiration for the hearing loss community. A fantastic blog charts the preparations, adventures, and post-trip reflections of the teens and their guides along the way, including staff from the National Park Service Natural Sounds Program. “From the standpoint of environmental protection, it’s necessary to decrease noise pollution in marine ecosystems,” BfN acknowledges in the introduction of its recent report. The study looks to the guidelines set forth by the Federal Environment Agency (UBA), which suggest that noise outside of a 750 meter radius from the construction site should not exceed 160 decibels. Techniques like bubble curtains, according to the BfN report, can meet this standard.However Greenpeace takes issue with this value because it is based on single-sound exposure — and it takes much more than a single punch into the bed rock of the sea floor to install a wind turbine foundation. Here’s a great fifteen-minute radio feature from Voice of America that digs into the issue of shipping noise and its effects on ocean life. It features Michael Jasny of NRDC, recordings of shipping noise off Vancouver Island, NOAA’s Michael Bahtiarian on their quiet research ships, and Kathy Metcalf of the Chamber of Shipping of America. This is somewhat old news, but I just heard about this workshop (thanks to Kathy Hemenway), and it’s full of useful insights: in March, the Consensus Building Institute brought together 100 wind farm developers, environmentalists, state regulators, and technical experts, including proponents and opponents of wind energy, to spend three days discussing what works – and more importantly, what doesn’t work – as communities seek to make informed and effective decisions about wind farm siting. Don’t let wind developers proceed without discussing how turbine operations might have to be restricted to reduce the risk to wildlife and the annoyance to neighbors. Do realize that everyone reacts differently to noise and visual impacts. It’s very clear that the traditional “town meeting” or “hearings” approach to energy facility siting is useless. Nobody learns anything at raucous public meetings…..Professionally facilitated stakeholder engagement (involving representatives chosen by the stakeholder groups themselves) can create a level playing field in which informal problem-solving is possible. This all has to be completely open and accountable. Interesting stuff! And here’s a long blog post from one of the participants, including links to most of the Powerpoints and a lot of audio from the three days. A drilling rig is up and running in Cook Inlet, along the southern Alaska coast. The rig, which will remain in the Inlet for 8 or more years, drilling numerous wells during the short summer seasons, expects to complete this first oil and gas well by the end of October, well before ice develops. 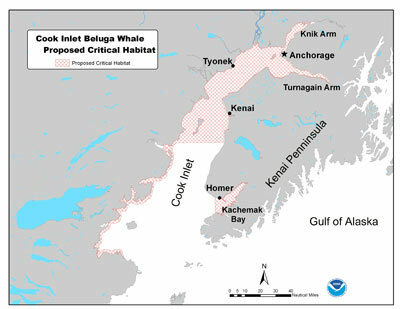 Local environmental groups pressed the Army Corps of Engineers and NOAA to not allow the rig into the inlet, citing concerns that oil and gas development activity will negatively impact a recently-designated 3000-square mile critical habitat for the critically endangered local beluga whale population. In addition to possible impacts of a spill, noise from drilling in a central concern. The permits allowing drilling require the company to maintain beluga observation crews, and to reduce the speed (and thus noise) of the drill when belugas are nearby, and shut down operations if they come very close. Cook Inlet is over a hundred miles long, with Anchorage at its inner end; this is also the section of the Inlet that is now designated as critical habitat. The first drilling operation is in the central part of the critical habitat, between Kenai and Tyonek on the map below.For more on the situation, see the two links above, which go to fairly detailed articles in the local media, and see these two previous AEI posts about the Cook Inlet belugas. Wind development in the promising borderlands region along the Scottish/English border has come to a standstill, due to very low intensity ground vibrations interfering with a key nuclear test ban monitoring station in Eskdalemur, Scotland. The Ministry of Defence has been tracking the increasing seismic interference from wind farms in the region, and says that any more would push the wind turbine vibrations to the point that their seismic monitoring array would no longer be able to reliably hear distant seismic anomalies. 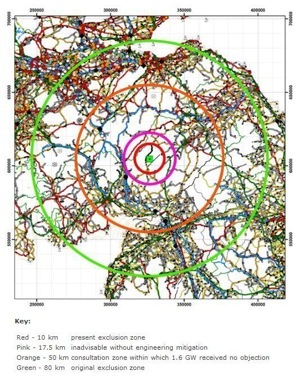 An earlier 80km exclusion zone has been a flexible one, with a period during which the MoD only excluded wind development as close at 10km from the installation, with several wind farms built in the 50km zone (orange circle at right). At this point, however, the MoD feels they have reached the limit of acceptable infrasonic interference. One wind power company, REG, which recently had a planned development rejected due to MoD objections, reports that efforts are underway to find a technological fix that could reduce the subtle vibrations that are causing the issues. One idea is to hang weights like pendulums inside turbine towers to deaden the vibrations from the blades. The MoD promised it would reassess its opposition if there were a proven technological solution. It must be stressed that the vibrations being discussed here are extremely small, far below what would be felt in a home. We’re talking about a sensitivity that can pick up small seismic anomalies from around the world. Nonetheless, even though the MoD’s concerns at 10-50km are about impacts far below thresholds that neighbors would notice, I do wonder whether dampening technology developed to address MoD concerns would also reduce some of the more localized vibrations. We need to keep clear the distinction between pure vibration, transferred through the towers into the ground, and the infrasonic elements of the sound from wind off the blades; it’s unclear that the proposed pedulum-inside solution would affect the in-air infrasonics. For that matter, the press reports are fairly vague about the source of the troubling seismic interference, with that reference above to it being related to wind off the blades, which would, indeed, imply that the strong infrasonic component of wind turbine sound is the source of the problem. Still, the MoD’s concerns about effects at 10km or 50km should not be taken to mean homes in these ranges are at risk. However, this does make me wonder whether any other industrial developments (factories, especially) that produce strong infrasonic sound are an issue at distances as far as 50km; if not, it may offer an example of how wind turbines are a relatively unique acoustic presence in the landscape. This is very interesting, though may get blown out of proportion: in April 2010 a District Environmental Officer submitted a memo to his Ontario Ministry of Environment superiors that offered detailed comments about the field realities he observed, in relation to the proposed Provincial wind farm siting regulations. These regulations currently guide Ontario siting, and call for at least a 550m setback, and sound levels at nearby residences of 40dB or less; the memo cites observations on the ground to recommend limits of under 35dB, and perhaps as low as 30dB. For the second of a planned five summers, a team of researchers is spending a couple weeks in waters off southern California, attaching suction-cup acoustic tags to whales, then playing sounds underwater to see how they respond to different sounds and intensities. Another two weeks of field work will occur in late September. As Brandon Southall notes on his SEAblog, which provides excellent coverage of the trip, the team is “interested in testing the differences in responses of marine mammals in the various kinds of habitats in which they live and are exposed to human sounds.” After several years of study, the research is moving beyond simply getting one or two examples of any given species, toward the development of a wide array of examples of each species, in different circumstances (at least for the easier-to-tag species). The study is known as a Behavioral Response Study (BRS), which used to be called Controlled Exposure Experiments (CEE), with the CEE term still in use as the name of each individual playback to a tagged animal. This year’s southern California version goes by the name of SOCAL-11. The acoustic tags used in the study allow researchers to record the actual sounds heard by the animals (including of course their own foraging and communication vocalizations), while also tracking their swimming speed and dive patterns. Rissos dolphins are among our focal species for SOCAL-11 experiments. We conducted one CEE on this species last year in SOCAL-10 and have been hoping for more this year. This species has also proven somewhat difficult to tag in the past and our tags on last year were for just a few hours, so to get a nine hour deployment spanning several different behavioral modes was pretty exciting. The tag came off late into the evening, but quite close to our anchorage and we made a beautiful late night ride in very calm seas and a red-yellow moon out to safely retrieve it. In addition to increasing the data set of carefully measured behavioral responses to sound, the researchers are testing two leading-edge technologies: a next-generation acoustic tag, and a towed hydrophone system deployed from a sailboat that’s being used to try to find animals for possible tagging by hearing them from afar. 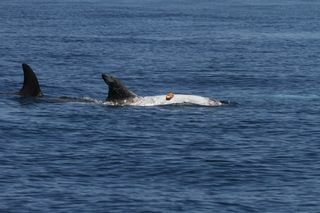 Plus, associated research is underway, including a study of the prey and oceanographic conditions around tagged animals, which aims to learn something about how the ocean conditions relate to where the prey is, and thus where the whales are, as well as to see whether behavior in response to sound is different when prey is present or not. The island community of Vinalhaven, Maine, remains embroiled in a contentious wind farm noise controversy nearly two years after three turbines began operating there. The nearby Camden Herald-Gazette recently provided a good, detailed overview of the latest rounds of the back-and-forth between nearby neighbors, the local electrical coop that buys the energy, and state regulators. An escalating legal tussle has developed since the Fox Island Wind Neighbors paid for noise monitoring and submitted data to the state indicating that the turbines were at times exceeding their regulatory limit. The most recent salvo is a complaint filed in state court charging that state Department of Environmental Protection commissioners have overstepped their authority by over-ruling staff recommendations on how to deal with the violations. The neighbors charge that compliance recommendations were watered down, and, most recently, requirements that Fox Island Wind prove ongoing compliance were removed. The complaint details the unfolding disagreements, beginning in April 2010, continuing through September 2010 when the state DEP officially reported that the turbines were out of compliance by a few decibels in some conditions. Since that time, the complaint charges that three successive DEP Commissioners have meddled in the compliance process, culminating most recently when, according to the petition, “Acting Commissioner Aho, over the objection of DEP professional staff, and in direct contradiction of the findings in the November determination of noncompliance letter, issued a compliance condition order.” The petitioners are asking the court to vacate Aho’s order and replace it with an order drafted by DEP staff, and to review the alleged instances of political intervention. The article linked above contains extensive quotes from the complaint, as well as from Fox Island Wind, the local developer of the project. Meanwhile, as part of ongoing efforts to seek innovative solutions short of curtailing operations, the local turbines are in the process of being modified by GE, their manufacturer. 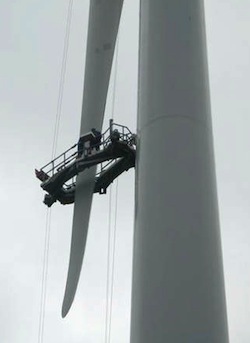 Crews are applying serrations to the trailing edge of the blades; this experimental technique is designed to improve air flow off the blades, thereby reducing noise output by 2-4dB. See this 2008 AEInews post about earlier research into such techniques. Throughout the controversy, including in this article, Fox Island Wind has often returned to the idea that the ambient noise of wind in trees is a key factor in the higher recorded sound levels, while neighbors insist that the turbines are clearly heard through this ambient noise. In many ways, the Vinalhaven situation is a perfect example of one of the key, and often-overlooked, factors in wind farm noise debates: the regulatory limit is high enough that even when in compliance, turbines can be clearly the loudest thing in the local soundscape, triggering severe annoyance reactions and sleep disruption for nearby neighbors. While the legal sparring focuses on a 1-3dB violation of the operating standards (a difference in volume that is barely perceptible at best), the underlying fact is that even the allowed 45dB is too loud for many of those living within a half mile or so. A couple of in-depth reports on communities roiling with wind farm controversies are currently viewable online. Both seem to present a fairly balanced story, featuring locals struggling with noise, locals and consultants who see the problems as minimal and wind development as necessary and important, and some government officials trying to make sense of it all. My reaction to the first one, Against the Wind, is below; I’ve yet to complete the other, a much longer series from the UK entitled Blown Apart: Wind Farm Wars, which appears to consist of four hour-long segments. From Australia comes an hour-long investigative report from Four Corners, a 60 Minutes style weekly TV program. The report, entitled Against the Wind, can be viewed here (transcript also viewable online). Both of the featured families who are negatively impacted come off as reasonable folks, not hot-headed complainers or people caught up in fears seeded from internet research. One of them is Noel Dean, a fairly well-known name among those tracking these issues from afar (on the internet, yes! ), and the others are Carl and Samantha Stepnell. Dean and the Stepwells both abandoned their homes due to noise and severe physiological reactions, though they return to work their farms. The Stepnell’s home is 900 meters (over a half mile) from the nearest turbine, with three others within 1200 meters (about three quarters of a mile); they weren’t affected right away, but after about six months began being affected. Though they tried to ignore it and live with it, the were soon being awoken most nights and having headaches and other stress responses. The stories told by Dean and the Stepnells are familiar to many others within a kilometer or two of wind farms. The show also includes a glimpse of some recording done at Dean’s home by Graeme Hood, where there was significant energy at lower frequencies, but not as much deep infrasound as Hood had suspected would be needed to account for some of the impacts. There are clear statements of many of the also well-known responses from industry and pro-wind folks, about the lack of clear data on any negative impacts, as well as footage of an event held by a community group that includes provocative images of burning turbines and distressed speakers urging the whole industry to be “shut down, everywhere” due to health concerns.